Kanji vada is very popular in Marwari families. 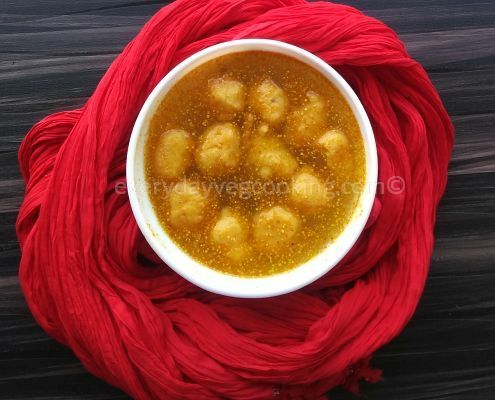 It is a festive dish and most of the families make kanji vada on Diwali, Holi and on Sheetala Ashtami (basoda puja). This desi drink is also a very famous street food of North India. During the festive season, people eat rich and heavy food and face many digestion problems. During such times, kanji helps in detoxifying the body and keeps the digestive system stable. Refreshing sour, spice and tangy kanji is a fermented, probiotic drink. It is a digestive drink. It has cooling and soothing properties. Kanji vada is made by immersing moong dal vadas in fermented sour and tangy mustard flavoured water. 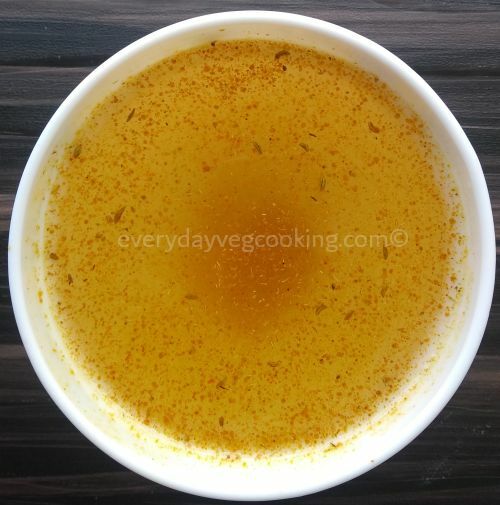 Kanji (rai ka paani) is prepared and kept aside for two to three days to mature, and on the third day we fry moong dal vadas and immerse in kanji water. Make kanji and keep aside for two days. After two days, fry vadas and immerse in kanji. In a glass or ceramic jar, take 2 litre filtered water. You can also use boiled water once it has cooled down. Heat sarso ka tel till its smoking point and let it cool. Grind sarson and saunf into a coarse powder. 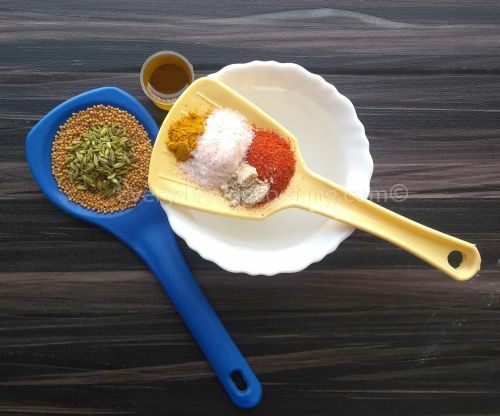 In a bowl, combine this coarse powder with haldi, lal mirch powder, hing and salt. Now add oil to it and mix everything properly. Add this mixture to the filtered/boiled water and mix well. Cover the container and keep aside for 2 to 3 days. Stir the mixture ones or twice every day. Always use clean and dry spoon to stir the kanji. Rinse and soak moong dal in sufficient water for 3 to 4 hours. 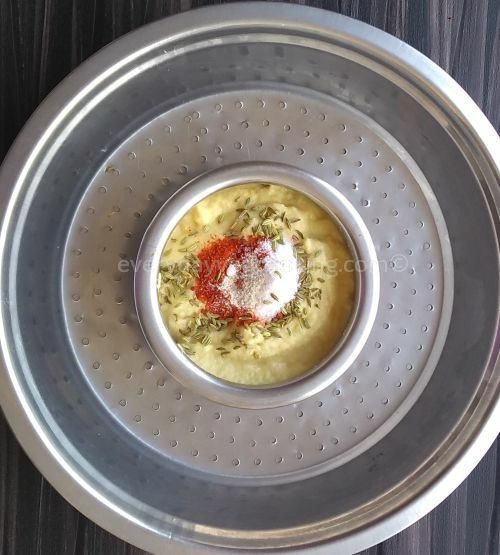 Drain water and keep dal in a colander to remove all the extra water. 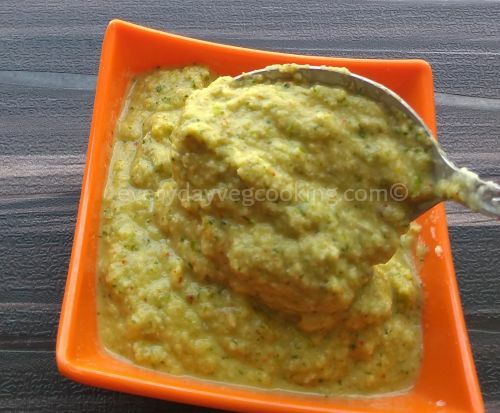 Grind dal into a smooth batter without adding water. Transfer dal batter to a strainer and sieve the batter through it. You will get a light and fluffy batter to make vadas. (I like this method although you can aerate the batter by beating it with your hands too). 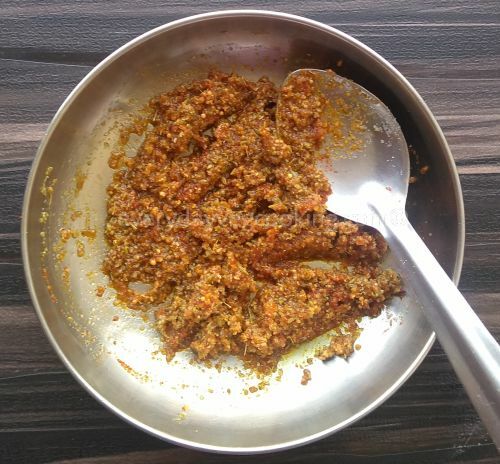 Now add saunf, hing, lal mirch powder, and salt to the batter and mix well. Heat sufficient oil in a kadhai (wok). When the oil is medium-hot, put small vadas in it. Fry the vadas until they turn crispy and golden in colour. Drain vadas on absorbing paper. In a bowl, take fresh water and soak vadas in it for 15 to 20 minutes. Now take out vadas from the water and gently press it between palms to remove excess water from it. Now put these vadas in kanji water. After few hours, sour, spicy and tangy kanji vada with its pungent taste of mustard will be ready to serve. After adding vadas, you can keep kanji vada for two days on the kitchen shelf. After two days, keep kanji vada in the refrigerator and finish it in 3 to 4 days. This one was really yum. I made the kanji, but didn’t turn out like yours. Will try again once it becomes a little warmer. I will make kanji and send for you . This is similar to Vada soup in South. Shall try this. I have heard about vada soup but not tasted, will try some time . Hope you like kanji vada.